No matter how many times you visit Europe, there’s always something new and exciting to discover. From the icons of London to the romantic streets of Venice, Santorini and beyond, this tantalising 20 day journey will help you sample the very best of six diverse European countries by land and sea. Begin your European odyssey with free time and a guided tour of London, taking in sights such as Piccadilly Circus and Covent Garden. Travel by ferry across the Strait of Dover to Calais and on to beautiful Paris, where you’ll see icons such as the Eiffel Tower, Arc de Triomphe, Notre Dame and more on a city tour. 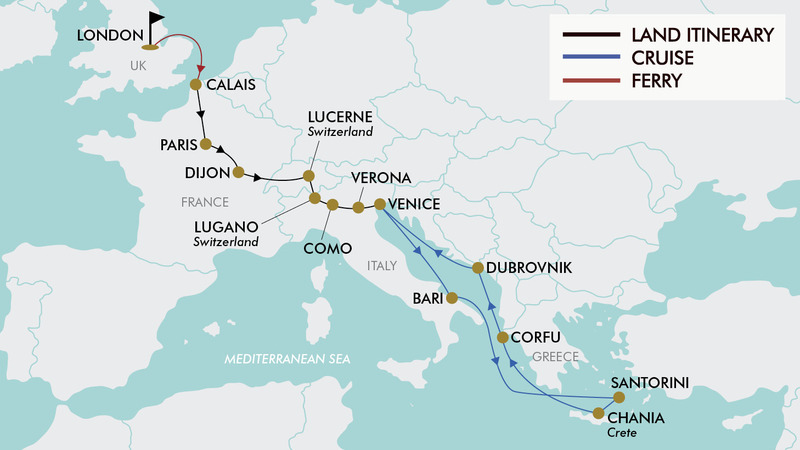 Journey through the countryside to Dijon, capital of the famed Burgundy wine region; visit Lucerne, the lakeside city in the beautiful Swiss Alps; marvel at lakes Lugano and Como, playgrounds of Italy’s rich and famous; enjoy a walking tour through the historic streets and piazzas of Venice and more. From the ‘floating city’, set sail on a dazzling seven-night cruise aboard the MSC Magnifica. Sail to vibrant ports including Santorini in Greece, Bari in Italy, Dubrovnik in Croatia and more! With return flights, 10 nights quality hotel accomodation and a seven night MSC cruise, this trip has everything needed to make your European travel dream come true! Today depart from Sydney, Melbourne, Brisbane, Adelaide or Perth for London, England. Fly with award-winning premium airlines Emirates, Etihad or Qatar Airways (subject to availability). Upon arrival, be met by your TripADeal transfer assistant and be transferred to the hotel. In the morning, depart from the hotel for a panoramic tour of London. Take in famous sights such as Trafalgar Square, Piccadilly Circus, Covent Garden, Regent Street, Oxford Street, and more. See the Albert Memorial, Royal Albert Hall, Parliament House, and the London Eye Ferris wheel. Next travel past the Tower of London; a medieval fortress built in the year 1078 by William the Conqueror, before returning to the hotel. Enjoy the remainder of the day at leisure. After breakfast, drive to Dover where you will embark the ferry to Calais, France. Afterwards enjoy a scenic 4-hour drive (290km) southbound to Paris, the City of Light! Today you will enjoy a sightseeing tour of this beautiful city with your Tour Leader. See highlights including the Eiffel Tower, Notre Dame, Seine River bridges, Arc de Triomphe, Champs Elysées and Place de la Concorde, plus visit the famous Saint Germain neighbourhood. Enjoy breakfast this morning before beginning the scenic journey south-east to the Burgundy region - famous for producing top quality wines. Arrive in Dijon and enjoy a panoramic tour of the city, taking in sights such as the Notre Dame, the Place de la Liberation and the Cathedral, to name a few. Continue to the famous Fromagerie Gaugry, where you will enjoy a wine and cheese tour and discover why their quality products are among the best in the world. Today you will travel eastbound from Dijon, passing through Mulhouse and Basel, arriving in the city of Lucerne in the early afternoon. On arrival enjoy a panoramic tour of the city, which lies on the shore of Lake Lucerne. Enjoy sights such as the world famous wooden Chapel Bridge and Water Tower, the Musegg Wall, the Jesuit Church, the Mill Bridge, the Lion Monument and the KKL (Lucerne) Culture and Convention Centre. Leaving the city of Lucerne behind at approx. 11:00am, continue to Italy. On the way see Lugano Lake at the Switzerland-Italy border (approx. two hours). Enjoy a short visit to the vibrant city of Lugano, nestled on the lake’s sunny north shore. This charming city offers visitors an array of restaurants and bars, as well as the famous via Nassa shopping district, which boasts of row upon row of boutiques and department stores. Continue to Como for a nice afternoon tour, starting from the lakefront and Piazza Cavour and continuing to Duomo, San Fedele church, the Broletto and Villa Olmo. This evening check-in to the hotel. Enjoy a free day to explore Lake Como on your own. After breakfast continue onwards to Verona for a short stop to see Juliet's Balcony, inspired by the Shakespearean tale of Romeo and Juliet, and then continue to the Venice area for the night. Enjoy a full day in Venice, beginning with a walking tour along the canals. As you explore the cobbled laneways and grand squares, you'll soon understand why the city is regarded among the most romantic in the world. See famous sights including the Rialto Bridge, Doge's Palace and St Mark's Clocktower. You can also take a vaporetto (water bus) down the Grand Canal (vaporetto not included, approx. €10 per person/each way). After breakfast be transferred to the cruise terminal to embark on your magical seven-night MSC Greek Islands Cruise aboard the ‘MSC Magnifica’. The cruise will depart at 5:00pm. An ancient city just waiting to be discovered. It’s worthwhile simply wandering around the old city of Bari, or you can join an optional shore excursion (not included). Bari is home to an entrancing jumble of streets, lively cafes, and a charming waterfront filled with colourful fishing boasts. Take advantage of the many facilities onboard or relax and bask in the Mediterranean sun. The jewel in the Greek Islands crown, Santorini offers countless opportunities to take photographs on every corner of this volcanic island in the Cyclades. Renowned for its beautiful white-washed buildings and blue-domed churches, it truly is one of the most stunning islands in Greece. Chania is a city on the northwest coast of the Greek Island of Crete. It’s known for its 14th-century Venetian harbour, charming narrow streets, and busy waterfront restaurants. On the northern most edge of the Ionian islands, with its lush vegetation and picturesque coastline, is Corfu - a unique mosaic of cultural and artistic influences. A walled, sea-battered city lying at the foot of a grizzled mountain, Dubrovnik is Croatia’s most popular cruise destination, and it’s easy to see why. This medieval city was reshaped by Baroque planners after a disastrous earthquake of 1667, and its historic core seems to have been suspended in time ever since. This morning dock back into Venice. After disembarkation (please allow approx. two hours to disembark) you will need to make your own way to the airport for your return flight back to Australia. Please note: some flights may arrive in Australia +1 day later. Travel offer is valid for travel on selected dates until the 26th of October 2020.
dates/months with a * incur a cruise high season surcharge of $150 per person. dates/months with a ^ incur a cruise peak season surcharge of $300 per person. Etihad Airways, Emirates and Qatar Airways and any codeshare partners (subject to availability). All cabins are subject to availability; some cabins may have restricted views. - Valid for Children/infants 10 years old and over. Minimum group size 20, maximum group size 42 per vehicle. - prices are based on 2018/19 rates and my change slightly in 2020. - Shore excursions can be booked/reserved directly with the cruise line prior to travel (subject to availability). - Shore excursions can also be booked whilst onboard (subject to availability). - Meals/beverages not stated in the itinerary (including any specialty restaurants onboard cruise). * Land: Recommended at €5 per person/ day payable to the tour leader on tour. * Cruise: Mandatory at approx. €10 per person/day payable onboard at the end of the cruise. - Mandatory city taxes/check point fees: approx. €30 payable on tour (please note pricing is subject to change). - Optional activities/tours (including any 'onshore' excursions as part of cruise). - Transfer cruise port to airport (day 19). As this deal covers multiple countries, temperatures will range from low to high 20's. Travel period is over the European high season, so expect dry, warm and sunny days. In May and Sep - the evenings may still require an additional layer of clothing. Please note: Travellers booked via TripADeal will not be entitled to receive any cruise line customer loyalty discounts. Similar to airline frequent flyer programs, this is outside of the TripADeal booking process. However, customers may contact the cruise line direct upon receiving their TripADeal travel documents to request any membership benefits they are entitled to. Gratuities (tips) are not included in the tour price for services of the tour leader (when available) and driver throughout the tour. The recommended tip for the tour leader and driver is €5 per person per day, which will be collected whilst on tour. Tipping for the cruise is mandatory at €10 (approx. $16 AUD) per person/day and will be automatically charged to your onboard account. Please note; additional extras purchased onboard will also have a gratuity of up to 18% charged on top of the normal ship board gratuity. A Tourist visa is not required for Europe for stays up to 90 days if travelling on an Australian passport.